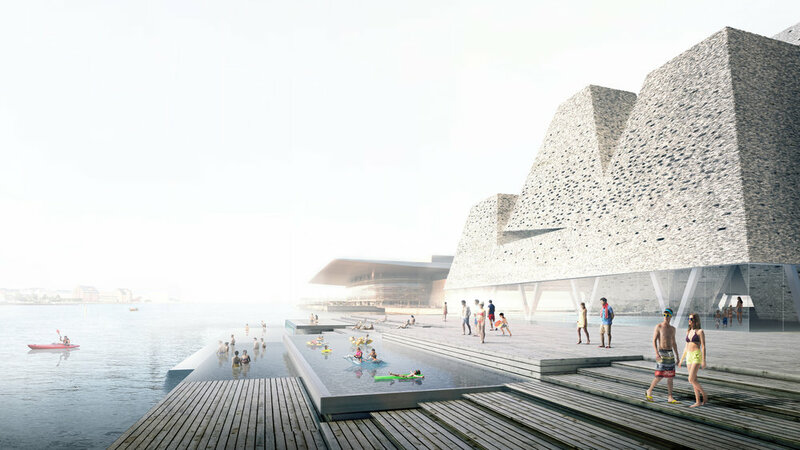 It has just been announced that the Japanese studio of Kengo Kuma will design the new aquatic centre on Christiansholm … the island at the centre of the harbour in Copenhagen that is generally known as Papirøen / Paper Island because the Danish press stored newsprint in the warehouses here. The most recent use has been for popular food halls, a gallery for modern art, various design studios and quite a lot of covered car parking. The key feature of the new building will be high brick pyramids - to follow the overall scheme for the island from COBE - but the swimming pool at the main level is to have glass on all sides for panoramic views and there will be a terraced walkway and shallow pools stepping down and forward towards the harbour.